We welcomed as our special guests at the December 20, 2018 meeting members of the Millennium Falcons, the Torrey Pines High School Robotics Club. Team leaders Danny Maas (President and grandson of well-known Del Mar resident and former city mayor Earl Maas), Jonathan Mi (Head of Design and Build), Emmie Yao (Head of Business), and Farrah Kaiyom (Head of Outreach) brought this year’s robot “Darth Elevader” that had lift and climb abilities to satisfy goals for this year’s FIRST challenge. Click here to watch the lift mechanism in action. 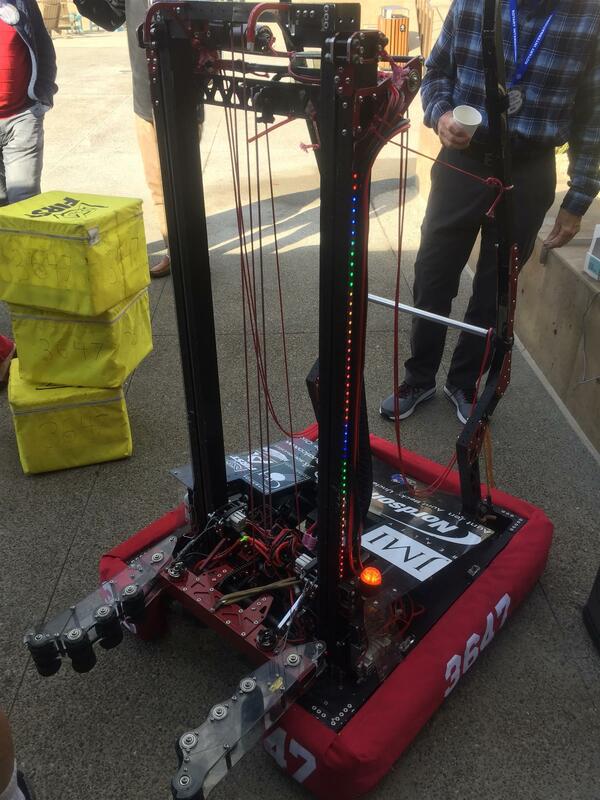 The team works with an annual budget of $50,000 that covers the cost of building their robots as well as the team’s outreach activities that include teaching local elementary school students the basics of robot design. They mentor the Technobotic Dolphins at Del Mar Heights Elementary and helped the Casa di Amistad engineering club acquire a 3-D printer. The Falcons thank Rotary Club of Del Mar for being one of their Platinum-level sponsors.